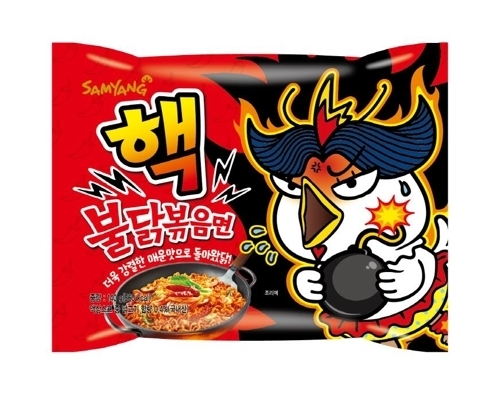 Samyang Food announced on Friday that the discontinued “Haek Buldak Spicy Chicken Ramen” will return, with an upgrade to make the ramen even spicier than before. “We decided to officially bring back the product to express our gratitude to customers who loved the ‘Haek Buldak Spicy Chicken Ramen.’ Samyang Food will strengthen communication with customers to put out products that meet the public demand.” Samyang Food said. The renewed Haek Buldak Spicy Chicken Ramen, also known as 2X Fire Noodle to non-Korean speakers, will have an increased Scoville Heat Units of 10,000. The renewal added approximately 2,000 Scoville Units to the original 8,706, making the 2X Fire Noodle the spiciest ramen in Korea and possibly in the world. The 2X Fire Noodle was released as limited edition in January 2017 and was discontinued in Korea in April that year. The ramen quickly grew popular and sold 8 million packets during the four-month period. The new 2X Fire Noodle is to be priced at 1,050 won ($0.9) and will be exclusively available at Samyang Food’s online store from Dec. 3. to 9. The product will become available at other Korean online shopping sites from Dec. 10.